Fraydele Oysher doesn't think of or refer to herself as a pioneer of feminism. However, long before the Jewish Reform movement came into being and women were embraced as Rabbis and Cantors in Synagogues throughout the world, Fraydele Oysher is the woman who played the major role in paving this new road for women. If you ask her how it all came about she'd probably say, "I had to make a living. When papa heard me singing to myself one day by accident, he sent me to work right away." 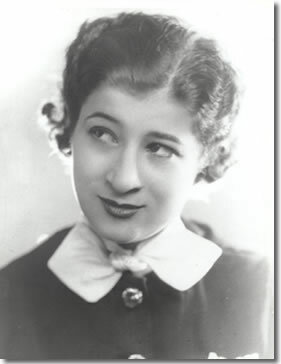 Born in Lipkon Bessarabia, Fraydele came to America at an early age with her father, who was a cantor, her mother and her brother Moishe. The children, both with magnificent voices and surrounded by an aura of religious music, were tutored in the chants of the Synagogue. Moishe went on to a career as an actor and star of classic Yiddish Art Films, and was later America's legendary Cantor known as "The Master Singer of His People". 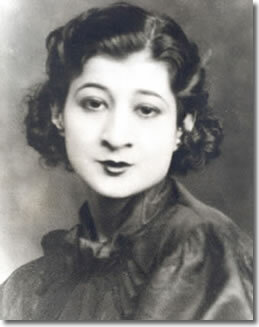 Fraydele was offered opportunities to sing as a Female Cantor in the synagogue, but times being what they were, she opted to remain on the stage. She was able to bring to the theatre the sound of the synagogue where it was a great novelty, and easily accepted, cleverly interspersed in shows written specifically for her vocal and comedic talents. As a teen she had begged her older brother Moishe to take her to New York because, "I was working in a pretzel factory in Philadelphia and I hated it." 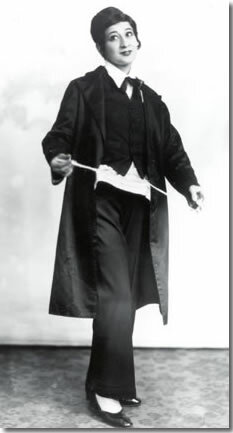 Fraydele's first significant job in New York paying $18.00 a week was at a theatre just across the Brooklyn Bridge. "I went there one day and there was a big crowd standing outside. Just my luck, I thought, it's a fire and I'll be out of work. I asked somebody what was going on and he said, 'There's a little girl that sings here...' and the crowd was waiting to buy tickets. 'That's me', I said, and I went in and asked for a two dollar raise." Ask her when she started on Second Avenue, and she doesn't hesitate, "When they let me!" She was Second Avenue's Fraydele, "The Little Queen", "The Golden Girl", a large voice in a small body. She fit perfectly into a favorite plot device: The Yeshiva boy who the audience discovers when it's time for the last act show stopper, is really a girl .... all this time before Streisand dreamed of Yentl. Fraydele's vocal and interpretive mastery of such diverse music as liturgical chants, theatre songs, and folk songs make the listener feel that they are hearing the piece for the first time. Her recordings of The Oysher Album, and The Oysher Heritage are available in most Tower Records, and some have become collectibles. Fraydele lives on New York's Upper West Side one block from her daughter, singer/comedienne Marilyn Michaels. Her son Michael Sternberg is a teacher/musician in the New York City school system. Recently widowed, her husband was Metropolitan Opera Basso Harold Sternberg, with whom she often performed in her plays. She now dotes on her grandchildren, Mark Wilk, 17, and Joanna Lee, 9 who are both endowed with the strong Oysher/Sternberg musical genetic gifts. Fraydele can still be seen in TV commercials and performs in concerts worldwide.